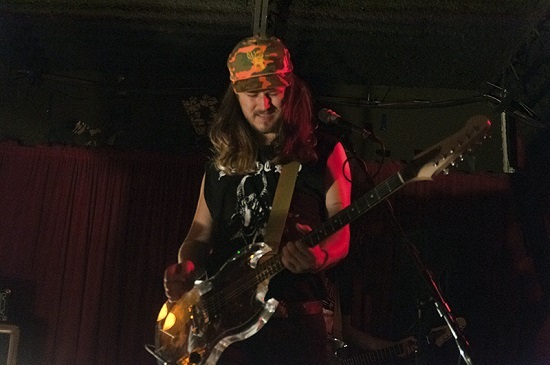 Like a poor man’s Weezer, who instead of making a wrong turn and getting lost in Beverly Hills, found themselves down in skid row and loved it, JEFF the Brotherhood not only understand the irony of a couple of everymen cranking out rock anthems, they embrace it. 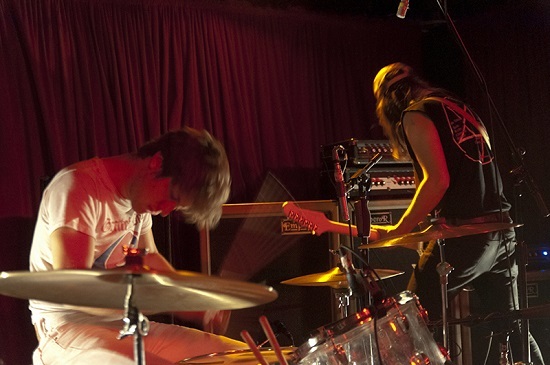 It was evident when brothers Jake (guitar) and Jamin (drums) Orrall anonymously took the Grog Shop stage with sheepish grins, Jamin dressed all in white with a Grateful Dead t-shirt and a conservative hair cut, Jake in black, with a sleeveless metal shirt and long, stringy hair. And even more evident once the brothers cranked out “Heavy Days,” a track pairing precise motorik rhythms with open-road, heavy metal guitar. On slower numbers, the crowd pressed at the front of the stage, a wave of heads nodded along. Faster numbers inspired faster head-banging. The really fast ones, got a pit. Well, that was until the drum monitor turned itself into a smoke machine during “Staring at the Wall.” After a couple false starts, for the brothers and the venue had to determine whether the smoke machine wouldn’t in turn become a fire machine, the Orralls went off. Jamin was all business-like, drumming with his head down. Jake, the devil of the pair, did his classic moves — The foot on monitor pose, bang with a head hidden under a mop top, and the always winning, wander in the crowd for a jam session. 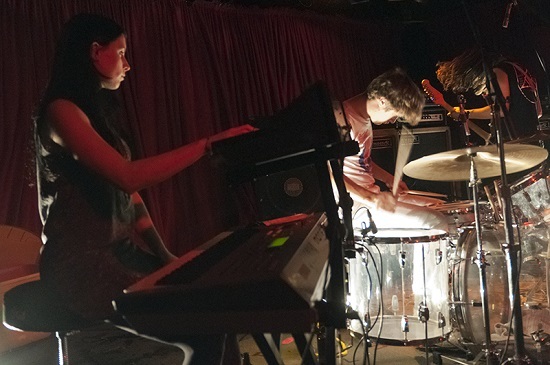 They hit on punk, metal, and psychedelic rock with a sound much bigger than one would expect from a two-man band. And if you weren’t particularly interested in thrashing, they were sure to add hooks and some good whoas and ohs in the chorus to bring you along. Barely a breath passed between the brothers. After ten years together, and countless tours across the country, they had their act down perfect. Which is why, as Jake would explain, they needed to change things up on this particular tour. He insisted bringing two extra musicians on for the second-half of their set, wasn’t an affront to their growing fan base, even though it was a greedy move. He’d continue, if they weren’t having fun in a rock ‘n’ roll band they might as well be working at Kroger’s. Can’t argue with that. Talent without passion is The Strokes. 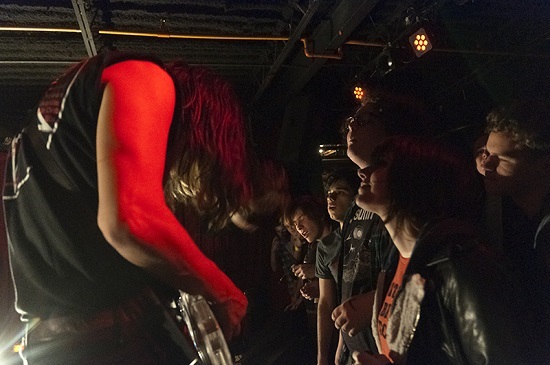 Besides, operating as a four-piece allowed JEFF the Brotherhood to stretch out and fill out songs like “Wood Ox” and “Heavy Krishna.” The keys operated in tandem with Jake’s strict rhythms and the second guitarist allowed Jamin further room to riff. It would be on “Dark Energy,” however, where the expanded lineup really proved its worth. Here, this ballad from their 2012 release, Hypnotic Nights, became a power ballad, not in the ’80s get the girl with poofy hair and tight jeans back stage kind of way, but in the truest sense of the word power. The two guitarists filled the space with a thick, dark doom, while the keys were layered in higher octaves. Whether the song was about a black hole, or mushrooms, as Jake would joke, its reach was undeniable. Smokier rooms would have turned into a sea of flickering lighters. These days, we’re left to our hands and our voices. All approved the brothers for their risky move.